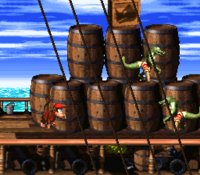 Pirate Panic is the first level of Donkey Kong Country 2: Diddy's Kong Quest and of its world, Gangplank Galleon. The level takes place on a ship deck. Since it is the first level, Pirate Panic only features basic enemies. 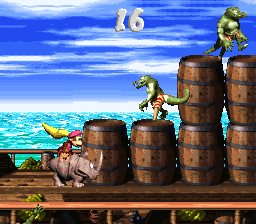 There are many groups of stacked-up barrels that the Kongs can jump on to reach collectibles. Kaptain K. Rool's cabin follows after the start of the level. It holds an Extra Life Balloon and a note from the crocodile himself, who states that he has kidnapped Donkey Kong and is holding him ransom in exchange for the Banana Hoard. Much like the first level of Donkey Kong Country, Jungle Hijinxs, the Kongs discover Rambi around halfway through the level, and is also required to break open a Bonus Area entrance. Somewhat like to Jungle Hijinxs's gradual day-to-night transition, Pirate Panic gradually changes from daytime to evening. The evening also occurs in the following ship deck stage, Gangplank Galley. Pirate Panic's transition effect was removed in the Game Boy Advance remake, but it still changes to evening in Gangplank Galley. At the beginning of the level, there is a straight path leading under a trail of bananas, which the Kongs can optionally collect if they throw one another into a hidden barrel at the start of the trail. A doorway with a pair of bananas in front it is farther ahead that the primates can enter to find a letter from Kaptain K. Rool and an Extra Life Balloon. A pathway is ahead of the bananas that leads the heroes up some stairs with a Neek on them. A crate stands at the top of the stairway near some large barrels that can hold up a nearby Klomp. They can find a Banana Bunch above the barrels. A stairway leading downwards is after these barrels, taking the Kongs towards a flat area with some more large barrels that they can stand on. A gap is between some of the barrels, and the letter K floats above this gap. A crate and a DK Barrel are ahead, followed by a stairway with Neeks on it. Four barrels sit at the top of the stairs with bananas on it. The fruits are formed in the shape of the letter R. The letter O is just ahead in a lower part of the ship, along with two Klomps. The Star Barrel follows the letter. Diddy runs near the Rambi Crate. A DK Barrel is after the Star Barrel, as well as a stairway holding two Neeks. A gap in the ship is ahead, but the Kongs can jump into it to find special items. On the other side of the gap, there is a Klobber and the letter N. These are followed by a tall pile of barrels with Klomps stomping around them. The Rambi Crate is on top of the barrels. More bananas in the formation of an R are also near here, being followed by stairs that lead down to a trail of Neeks. Many barrels that can be stood on are piled up ahead in a lower part of the ship. Bananas in the formation of an arrow are in front of them. Neeks march in the area ahead of here in front of some large barrels that can be jumped on to reach the DK Coin. There is a stairway after here that can be walked up to reach two Klomps, one of which stands on a few large barrels. Two more over-sized barrels are ahead with a Klobber on them. They can help the heroes jump to a raised part of the ship, where a No Animal Sign can be find. It can make Rambi disappear if he is in use. A barrel is found, which helps the Kongs land on the End of Level Target and receive a prize, either a Banana Bunch, Banana Coin, or a red Extra Life Balloon. After landing on the target, the Kongs exit the level and head to Mainbrace Mayhem. Banana There are 108 Bananas located throughout the level. The Kongs can blast from a Barrel Cannon just above the starting point. They can only reach it from using Team-up. Just after the letter K, to the upper right of the Bananas forming an "A" (or an "R" in the the Game Boy Advance remake). This indicates that it is only reachable with Team-up. On the far right of the first Bonus Level, directly below the Kremkoin. Next to the letter K after the group of three Neeks. Directly after the Star Barrel. Red: At the far left of Kaptain K. Rool's cabin, which also has his note. Green: By crossing Rambi past the No Animal Sign. Diddy and Dixie can enter the first Bonus Barrel shortly after the Star Barrel, by running down a crack in the ship. They must follow a short trail of Bananas to the right. In the Bonus Stage, the Kongs' objective is to jump between tall barrel piles and obtain the Kremkoin from the highest one within 20 seconds. After the Kongs mount Rambi, they can find a nearby wall, which is pointed at by Bananas in the shape of a left arrow. Rambi must Supercharge into the wall to break it, therefore allowing access to the Bonus Area. Their objective to defeat every Neek and Klomp within 20 seconds. A Kremkoin appears after they defeat every enemy. Located in the middle of two barrel platforms, in the air. Three Neeks patrol around the barrels. Floating in the center of a small pit with two Klomps, right before the Star Barrel. Behind the first Klobber after the Star Barrel; the Kongs can also automatically collect from entering the first Bonus Area. Just before the No Animal Sign, two Klomps walk around a set of five barrel platforms. The "G" is located at the end. DK Coin Diddy and Dixie can get the DK Coin after the second Bonus Area, by jumping off from a large stack of two barrel platforms. They can also use Team-up to reach it. Golden Feather (GBA version) The Kongs must travel through the level to find bananas forming the shape of the letter R on top of four barrels. If they use their Team-up move to the left of here, they can throw one Kong up into the air, who can grab the feather high above the barrels. Photograph (GBA version) The photograph is a picture of Rambi, whose photo is placed in the twelfth page of the Scrapbook. Diddy and Dixie obtain it after defeating the first Klomp of the second Bonus Area. The photograph can only be obtained when the Kongs receive the Scrapbook from Kong Kollege later. The Warp Barrel is hidden above the first barrel platform in the level, which itself is located after the first Crate. They can reach the barrel via Team-up. If they throw on another into the space that the invisible barrel is located, the Warp Barrel appears and sends them into a Bonus Level that takes place on a ship, where they can find a group of bananas that form an exclamation mark. 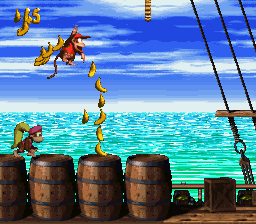 If they walk into a doorway to the right of the bananas, they are taken out of the bonus and onto a barrel platform placed immediately before the End of Level Target. Diddy throws Dixie at a Klomp. Diddy gets hit by a Neek. 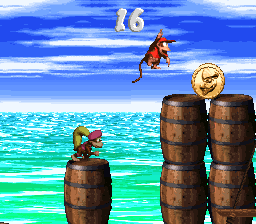 The Kongs use Team-up below a Banana Bunch Coin. The heroes travel mid-way through the level. There is a bug that allows the Kongs to obtain all 75 Kremkoins early. 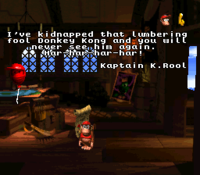 players should head into the cabin where Kaptain K. Rool's note is found, then leave without collecting the Extra Life Balloon or reading the note. The players should then collect the first Banana Bunch without collecting any other bananas. Then, they should go back into the cabin, without collecting any bananas, and grab the 1-Up Balloon. The players should leave the cabin, and repeat the second step. The player should go back into the cabin, without collecting any bananas. This causes numerous Kremkoins to spawn inside. This page was last edited on April 6, 2019, at 01:49.